If you're in love with your Catholic faith and want to share that love with others, this is the perfect shirt for you! This would also make a great gift for Confirmation, First Communion, completing RCIA, answering a call to a vocation, or just because you want someone else to be able to celebrate and share their faith as well. 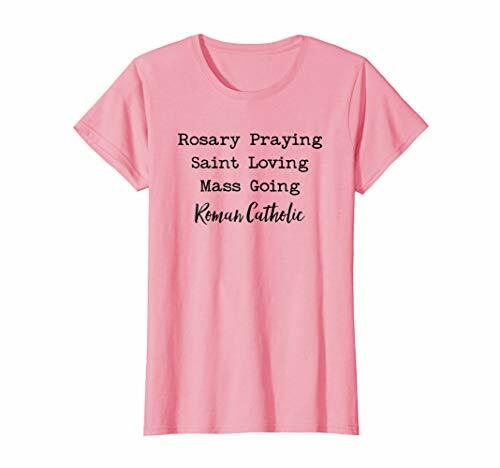 This shirt is a great way to let everyone know that you are a Rosary praying, saint loving, Mass going Roman Catholic! Perfect shirt for your favorite Catholic whether it's your devout Catholic Grandma, your enthusiastic Catholic teenager, your favorite priest or religious, and more! Share your love for the Catholic Church and the traditions of Catholicism with this t-shirt that proudly celebrates your Catholic faith. If you have any questions about this product by Holy Catholic Church T-Shirts, contact us by completing and submitting the form below. If you are looking for a specif part number, please include it with your message.